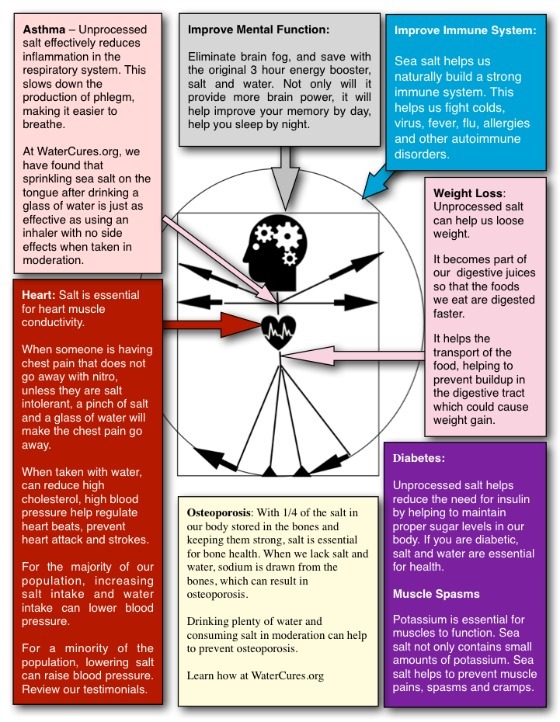 Here is a review of the various sea salt health benefits of salt. Virtually every substance, including water, is toxic in certain concentrations and amounts. Salt is the only exception. Most people (with rare exceptions or in kidney disease) excrete excess salt. Salt is essential for heart muscle conductivity. An eight-year study in New York City residents with high blood pressure with low sodium levels and on low-salt diets had over four times the number of heart attacks when compared to those with normal intake. Note, this is the opposite of what the Salt Hypothesis predicted. The National Health and Nutrition Examination Survey (NHANES I) found a 20% greater number of heart attacks among those on low-salt diets compared to normal-salt diets. When someone is having chest pain that does not go away with nitro, unless they are salt intolerant, a pinch of salt and a glass of water will make the chest pain go away. At water cures, we have done just this when there was no medical care available. When taken with water, can reduce high cholesterol, high blood pressure help regulate heart beats, prevent heart attack and strokes. Unprocessed salt effectively reduces inflammation in the respiratory system. This slows down the production of phlegm, making it easier to breathe. We have seen a number of people eliminate their asthma with the water cures protocol. At WaterCures.org, we have found that sprinkling sea salt on the tongue after drinking a glass of water is just as effective as using an inhaler with no side effects when taken in moderation. For the majority of our population, increasing salt intake and water intake can lower blood pressure. For a minority of the population, lowering salt can lower blood pressure. Sea salt helps us naturally build a strong immune system. This helps us fight colds, virus, fever, flu, allergies and other autoimmune disorders. Unprocessed salt can help us loose weight. It becomes part of our digestive juices so that the foods we eat are digested faster. It helps the transport of the food, helping to prevent buildup in the digestive tract which could cause weight gain. Unprocessed salt helps reduce the need for insulin by helping to maintain proper sugar levels in our body. If you are diabetic, salt and water are essential for health. Potassium is essential for muscles to function. Sea salt not only contains small amounts of potassium. Sea salt helps to prevent muscle pains, spasms and cramps. With 1/4 of the salt in our body stored in the bones and keeping them strong, salt is essential for bone health. When we lack salt and water, sodium is drawn from the bones, which can result in osteoporosis. Drinking plenty of water and consuming salt in moderation can help to prevent osteoporosis. A pinch of unprocessed salt and a glass of water will stop a muscle cramp inside of 60 seconds. Take the salt and water prior to going to bed and you may eliminate nocturnal cramps all together. Improves Sleep: Drink a glass of water and then take a pinch of salt in the mouth and you will sleep like a baby. Increasing salt has be successful in combating chronic fatigue syndrome.